As the movie Precious ascends to the top of the movie rankings this weekend, much will be said about the marketing power of Oprah and the film production wizardry of Tyler Perry. While both lent their names and followings to the promotional effort, the producing couple Sarah Siegel-Magness and her husband Gary Magness deserve equal credit as they acquired the rights to the novel PUSH from author Sapphire. It was the Magnesses who conducted the casting that landed Gabourey Sidibe, believed in director Lee Daniels and got the movie to Sundance where they made a deal with Lionsgate (5mil) who brought in Perry. I am not naive enough to say that having Oprah and Perry out in front of this movie doesn't enhance the profile or insure good draws at the box office, but I am for fair coverage and acutally find it interesting that at the heart of this gritty story about abuse in a black family, you have a white couple from Colorado believing in it enough to believe in Lee Daniels enough to sink the money to get it made. Having read this story, I will be happy for Mr. Perry and Ms Winfrey should Oscars come out of this film, but I'll also be looking to see how the Magnesses bask in their moment of glory on the dais. When Regis Murayi (in the P-coat) set up the culminating party for his trip to Chicago with 200 of his classmates, I'm sure the senior class president at Washington University in St. Louis didn't think he was going to be the one who wouldn't get into the party that night. Unfortunately he in fact didn't get in because apparently the jeans that he and six of his friends, also African American, were wearing were too baggy according to bar officials at Original Mother's. Needless to say Murayi and his peers found this "dress code" peculiar so they got one of their white classmates to put on Murayi's jeans and see if he could get in the club. Fernando Cutz had no problem with entrance, and he took a commemorative pic from inside the club with his baggy jeans so there could be no disputing his entry. This story is beautiful to me because as inexcusable as the behavior of the bar officials was, the response of the students is a classic example of using new millenium tactics to combat age-old ideologies of privilege and race. It would have been simple for the Black students to resort to violence or act out in some way that would have landed them in jail, creating a police record that would have trailed them as they tried to transition into the professional world. Instead they took advantage of new media to expose the behavior of the bar staff and shape the narrative that would be told as the story hit the national news. It is also of note the role of the White student, Mr Cutz, who was willing to use his privilege as a white dude for justice. His actions underscore the idea that it takes EVERYONE to combat racist ideologies. Now two weeks after the incident, the students and the bar owners are reported to be close to a "resolution" of the matter. The requests of the students have not been released, but it should be understood that the willingness of Original Mothers to negotiate is in part driven by the fact that the negative press they have received has affected their bottom line ($$$). Kudos to the WashU students for using their education instead of raw emotion to combat the racism they faced in Chicago. Even at 2, my son already recognizes differences in skin color, so it is important to help the growing chameleon understand what color means in this country. My little man must understand that he is never to allow people to put him in a box because of his primary skin color. He is also never to judge others based on their differences from him. As he gets older, he will come to understand that the idea of race is also not about color, but of power and privilege. His color does however link him to a cultural history and lineage which he must also learn because an understanding of this ancestry will give him a sense of how to use his multiple colors wisely. It is a blessing to have the ability to move in and out of a variety of contexts seamlessly. This skill does not come without practice. The parent chameleon must be able to provide support as the young one struggles with "color expression". The parent must also help the young one understand why they are placed into various settings meant to help enhance their "color quality". As a youngster this meant understanding why I had to take piano lessons when all I wanted to do was play basketball. Why did I have to take Latin in 7th grade when I was already taking Spanish. Why did I have to go to a private school when most of my friends went to public ones? 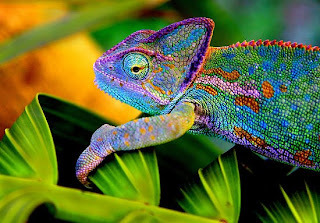 With each new color that the growing chameleon masters, the parent must continue to reinforce that they are not "selling out" who they are at the core, but instead are learning behaviors and skills that will be of benefit throughout their lifetime.